It was back up in the 90°s this weekend, after far too much cold and rain, the heat was a welcome change. On Friday evening I went to the Neville Wisdom Fashion Show in New Haven, Saturday and Sunday were pretty low key. Sean and I finally visited Joey C's Boathouse in Stratford, which was an unexpectedly pleasant venue by the docks, considering it's tucked away in the back of a stripmall and has views of 95 (but they are water views, and doesn't that make all the difference?) More importantly, we both really enjoyed our meals and were happy with the decision to venture a little further out to try it, rather than sticking with their original Milford location we've frequented more times than I can recount. What a fun weekend, Lydia!! I have to say I love this OTS shirt because even though it's off the shoulders, it's not so far down that it pops back up!! Brillaint! I LOVE that hat! Also, what a GORGEOUS location! I am always jealous of the perfectly nautical backgrounds you have! I wore something similar over the weekend! It's the perfect summertime look :) LOVE your hat! I love your outfit! It's definitely boathouse appropriate and it's nice to visit a new venue. It's always nice when you venture out to a new place and come back with great memories. Totally loving your neck scarf and your cute bag. 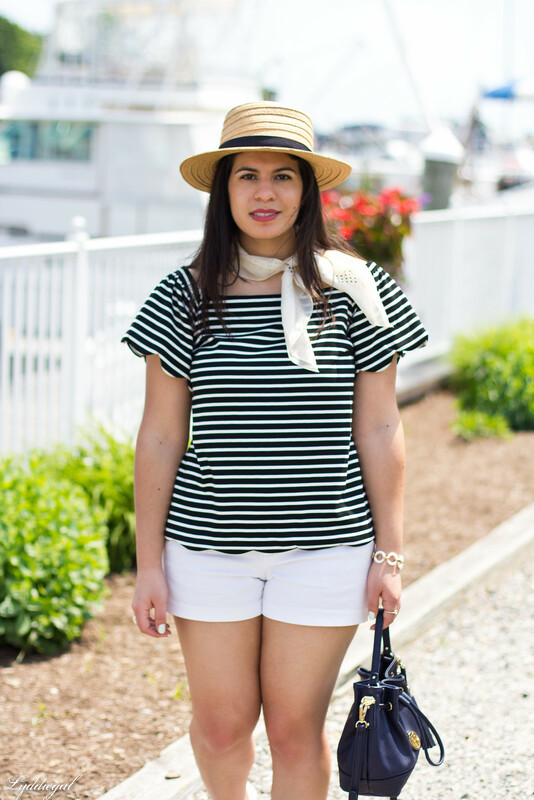 Oh there is a Venice gondolier feeling in this look which I absolutely love ! You look so good Lydia. Perfect for a waterside meal! Love your stripes, scallops, and especially that fabulous hat! 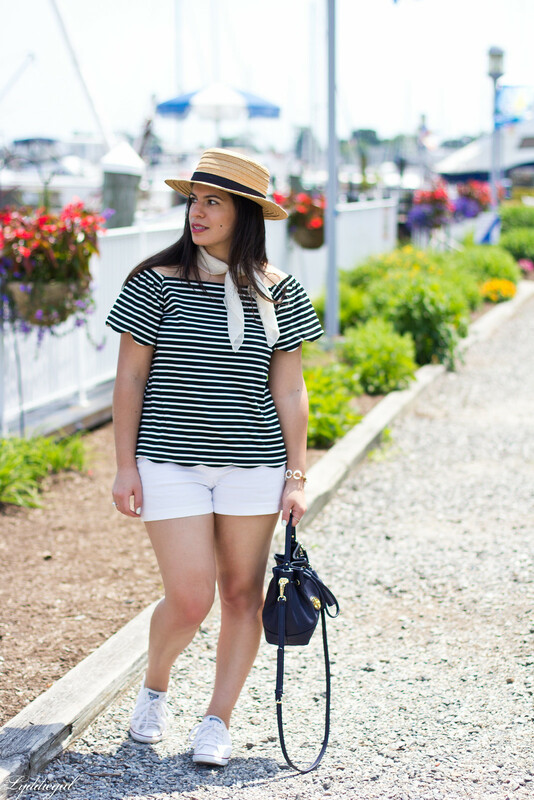 How cute is this nautical look! 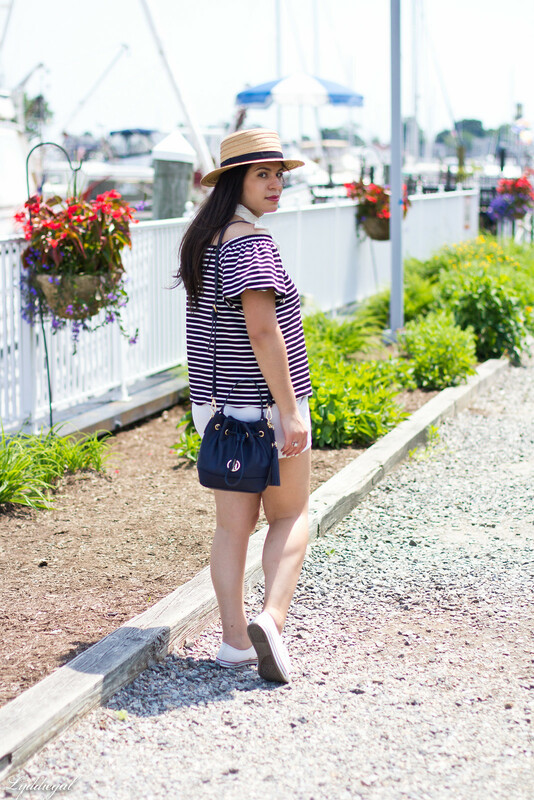 I love the straw hat and striped tee! Every time I see you in a hat I swear I want to rush out and buy one, even though I know for a sad fact that I will not be able to pull them off as well as you. You look brilliant - and three cheers for trying new things! Sounds like a great weekend and your outfit is so summery and cute. Yeah for great weather! I love this classic look! 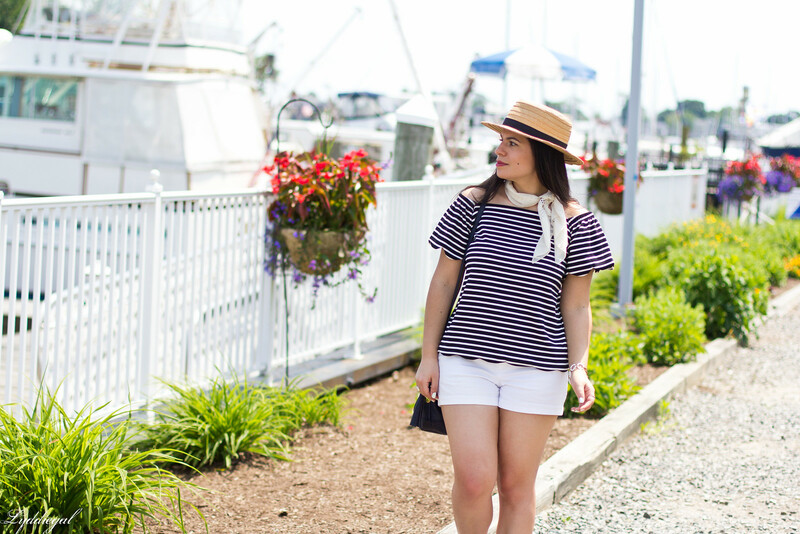 This stripes and white shorts are a fabulous combo! The scallops on this top are absolutely beautiful and there is nothing as classic like a striped top! Love the little scarf! This is such a cute outfit! I love the scallop detailing on your top! This is my kind of summer look - aside from a summer dress, of course! 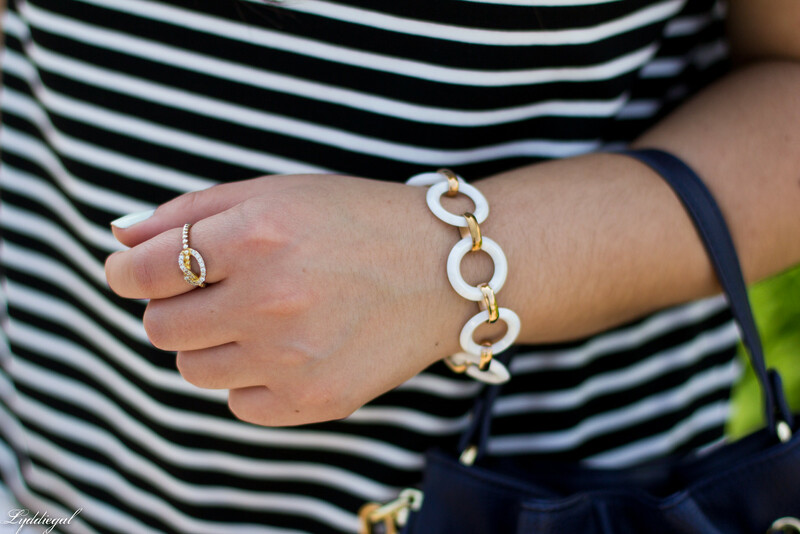 Love all of the accessories that make this simple outfit stand out! What a cute summer outfit, this looks super comfy and the hat would protect you from the sun perfectly! What a perfect outfit, complete with jaunty straw hat!!! This outfit says Summer has arrived. I love the French vibes. Such a cute top, hat, bag and bracelet. Coincidentally, I was just talking about hats on my blog. 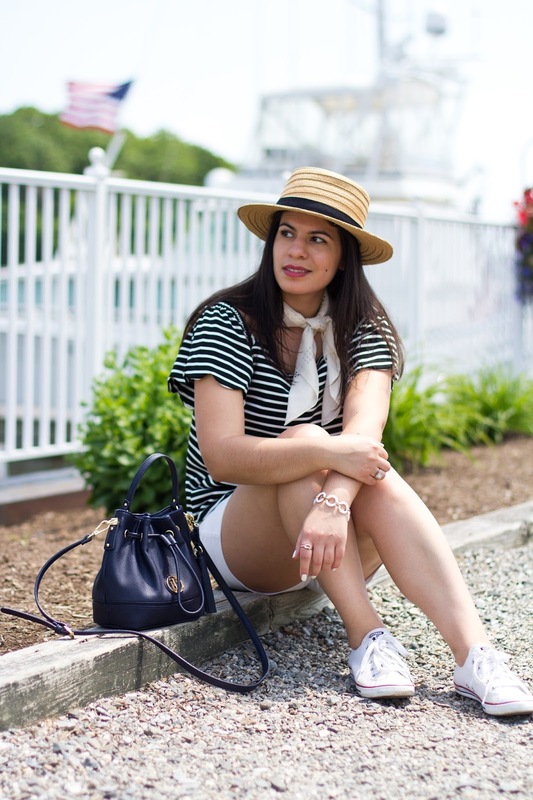 You perfectly showcased how to style it for a fun summer outfit. Look at how cute and French you look! I love how the sneakers give it a really relaxed, funky vibe. Yay for summer!